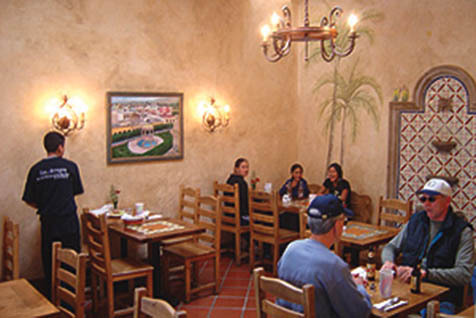 This frequent special at Los Arroyos (14 W. Figueroa St., 962-5541; 1280 Coast Village Rd., Montecito, 969-9059) is not just a mouthful to say, but also a mouthful to devour. The corn tortillas are soft with just the right puff and fluff, topped with grilled pasilla chiles, all flavor and little heat, grilled onions, and then Mexican chorizo-this is really sausage and peppers south of the border. The chorizo has that stained-red look and is covered with two kinds of cheese, Monterey jack and queso fresco, playing their round and sharp notes alternately. With rice and beans, this is a mighty meal.